– Efforts by the Russian intelligence services to exploit the negative socio-economic situation and various negative information events in order to organize protests among the civilian population. In Kharkiv oblast, the situation remains complicated, even though local authorities and law enforcement are taking measures to neutralize threats. In particular, significant efforts are being invested in anticipating critical situations. This includes tightened security measures (from expanding the video surveillance network to more intense street patrolling) and administrative decisions (such as the ban on unauthorized mass events until May 10). At the same time, the situation has been somewhat aggravated by the adoption of the decommunization law package (two weeks after the vote, unknown activists demolished 5 monuments to Communist leaders in Kharkiv alone; their actions were met with mixed opinions in the city). Anti-Ukrainian political forces continue their attempts to destabilize the situation in the context of social problems. Thus, on April 20, a meeting of the so-called “shadow government” of the “Opposition Block” took place in Kharkiv, followed by an information attack. Mykhailo Dobkin [former mayor of Kharkiv] even managed to call for the dissolution of the [Ukrainian] Parliament. Despite the official ban, separatist groups and anti-Maidan disciples are using social networks to invite Kharkiv residents to a rally on April 22. The declared agenda of the rally consists of social issues – protesting high [utilities] tariffs, rising prices, etc. We also expect events to commemorate Lenin’s birthday will be held [in the area]. 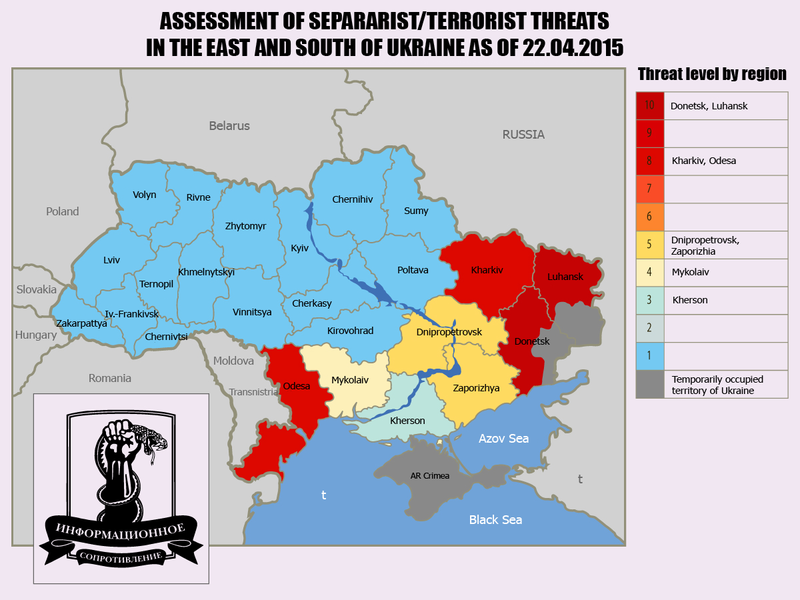 In Odesa oblast, the spectrum of threats has shifted, while their level remains at a generally stable negative. The mass detention of terrorist groups at the beginning of April has had a positive impact on the situation in Odesa, acting as a powerful “psychological” deterrent for anti-Ukrainian forces. Nevertheless, we forecast that attempts will be made to destabilize the situation (terrorist acts and provocations) by May 2. In this context, we are doubting the proactive effectiveness of local law enforcement officers, but it is offset by the relatively efficient work of the SBU [Security Service of Ukraine] – first and foremost, the “paratroopers” sent from Kyiv. Another positive factor is the Operational Headquarters of the patriotic forces in Odesa oblast, created by local patriotic organizations on April 16 (its positive impact is partially offset by the public disputes among pro-Ukrainian forces concerning the Operational Headquarters’ memorandum of establishment; this stimulates anti-Ukrainian forces). 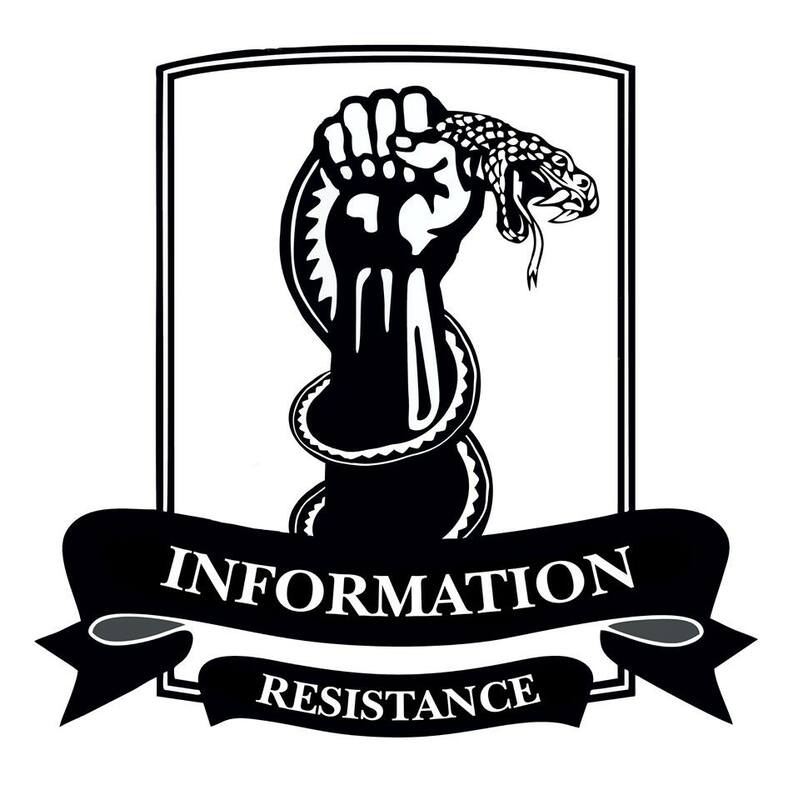 We observe a growing threat of infiltration by sabotage and reconnaissance groups from the territory of Transnistria. Plus, the threat of separatism from the “national minorities” (particularly in the border areas) has increased, given the unfavorable state of Ukraine’s information security in the region. In Zaporizhya oblast, against the background of the negative socio-economic situation, we’ve observed a growing threat of protests which can be used by the Russian intelligence services to rock the situation. Anti-Ukrainian (pro-Russian) forces are becoming more active as well. Amongst the positive developments, is a strengthening of security for strategic facilities in the oblast (firstly, the Zaporizhya nuclear power plant, now supplied with an additional physical protection service and a department of corporate paramilitary security), as well as railway and automotive terminals, and 13 strategically important bridges (by the police and servicemen of the National Guard of Ukraine). A reserve fund dedicated to rapid response [to security threats] was created in the oblast budget. Among the negative factors is the increased threat of an “export of terrorism” from the ATO zone, in view of the fact that Russia has temporarily changed the focus of its efforts from the conflict zone in Donbas to attempts to activate terrorist acts in other regions of Ukraine, primarily those that border Donbas. In other southern and eastern regions of Ukraine, the situation remains largely unchanged. This entry was posted in Dmitry Tymchuk, English, English News, Pictures, South&Eastern Ukraine, War in Donbas and tagged #FreeKolchenko, #FreeSavchenko, #freesentsov, #RussiaInvadedUkraine, #StopRussianAggression, #UkraineUnderAttack, Dmitry Tymchuk, Information Resistance, Ukraine. Bookmark the permalink.